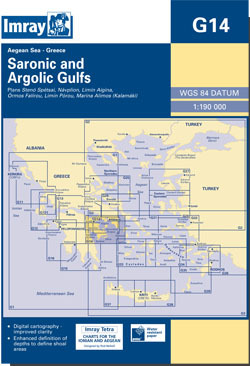 The Saronic and Argolic Gulfs. Scale: 1 : 189.000. Larger scale plans of Limin Porou, Ormos Falirou, Limin Aiginis (N. Aigina), Steno Spteson, Marina Alimos (Kalamaki). 2015 EDITION - On this 2015 edition details of firing and mine-sweeping practice areas have been added to the main chart. Plans of Órmos Falírou and Limín Aígina have been removed and replaced with new plans Stenón Metópis and Nisídhes Tselevínia. Positional accuracy has been improved on the Limín Póros and Návplion plans, the latter of which also shows revised depths.